PalDuct Eco system ... healthy option. 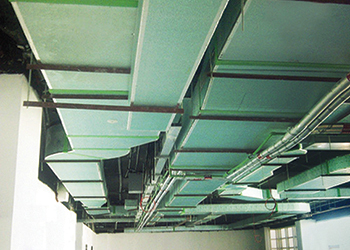 Kingspan Insulation says the facings of its PalDuct Eco panels, used in the fabrication of the Kingspan PalDuct Eco system of pre-insulated ducting, are now coated with Biomaster antimicrobial technology, helping the system to resist the spread of surface bacteria. Biomaster, from the leading UK-based additives supplier Addmaster, inhibits the growth of surface bacteria 24/7 and is effective for the lifetime of the product, she adds. It is based on silver ion technology. When bacteria come into contact with a Biomaster protected surface, the silver ions prevent them from growing, producing energy or replicating, therefore they die. The Kingspan PalDuct Eco System is an advanced and innovative pre-insulated rectangular HVAC ductwork system. It comprises lightweight Kingspan PalDuct Eco panels, which are fabricated by specially trained fabricators into ductwork sections up to 4 m long. PalDuct Eco panel ... coated with antimicrobial technology. “The antimicrobial coated system is especially suitable for food preparation areas, clinic, schools and hospitals. In fact, the system is suitable for anywhere where it is important to limit the growth of bacteria,” she emphasises. Other benefits of the pre-insulated ductwork’s ‘complete system technology’ enhance its appeal to specifiers and building operators. The system’s low level of air leakage and superior insulating properties can result in electrical consumption savings. With the Kingspan PalDuct Eco system, ventilation air flows over the antimicrobial protected aluminium surfaces and does not have contact with any material containing loose fibres, making it ideal for high specification projects. Kingspan Insulation, a division of the Ireland-based Kingspan Group, is a market-leading manufacturer of premium and high-performance rigid insulation products for building envelope and building services applications. The company has a manufacturing plant located in Dubai, UAE. 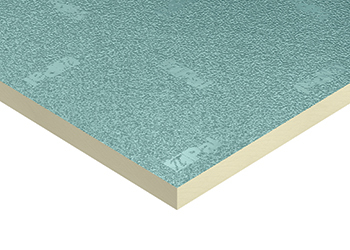 Kingspan Insulation offers a vast product range suitable for a variety of applications in the domestic, non-domestic, new-build and refurbishment sectors. Its products are divided into four categories: insulation boards for roofs, walls and floors; HVAC ductwork insulation and pre-insulated ductwork systems; pipe insulation; and engineered timber systems. Kingspan Group is one of Europe’s fastest growing building materials manufacturers and a global manufacturer of premium and high-performance, sustainable building products and solutions for the international property and construction industry.